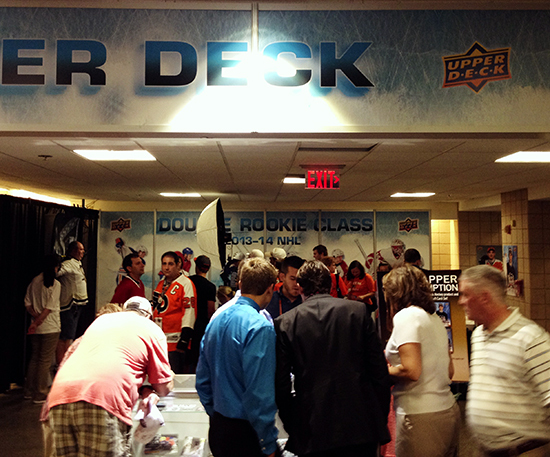 Upper Deck Brings Smiles to Hockey Fans of All Ages at the 2014 NHL Draft®! 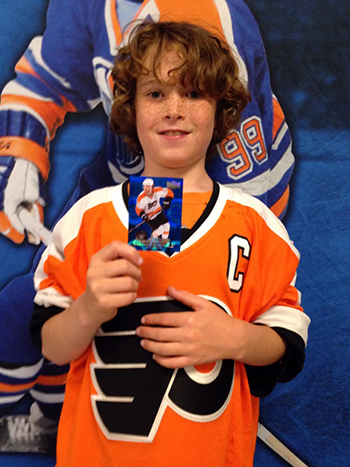 Upper Deck pulled out all the stops to make sure the 2014 NHL Draft® wasn’t just exciting for the players who heard their names called over the weekend. 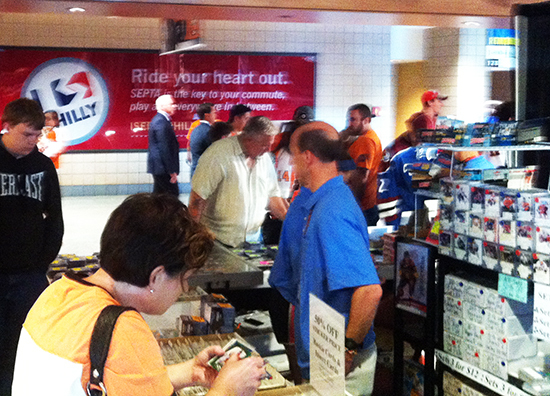 We worked hard to make sure that hockey fans both young and old all had something enjoyable to do throughout both days of this annual event. 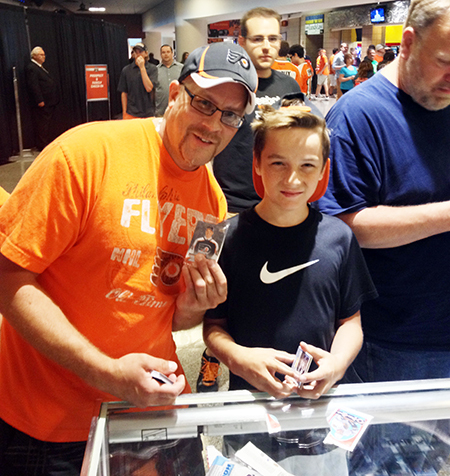 It was impressive to see how many hockey fans were also collectors in the Philadelphia area as they jumped all over Upper Deck’s popular wrapper redemption program! 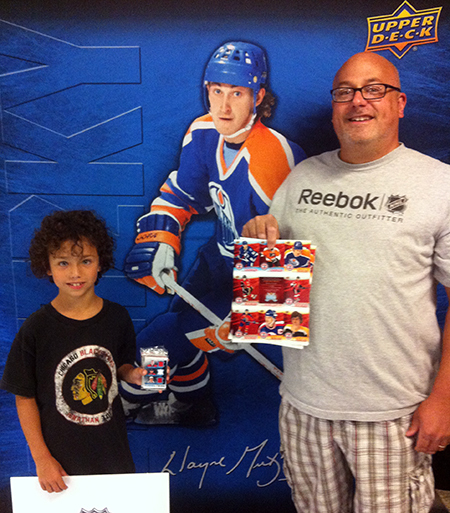 Dealers were busy providing packs to hockey fans for the wrapper redemption promotion! 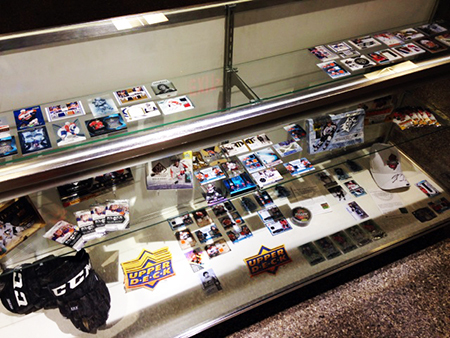 And they drooled over insert cards and signed memorabilia we had on display! 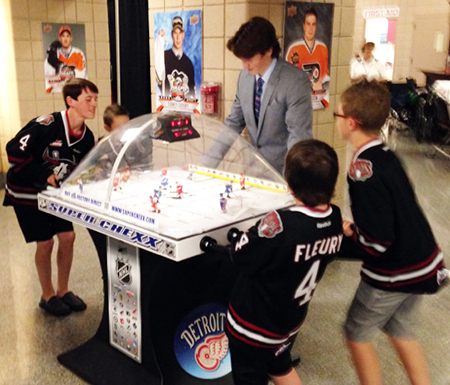 Kids are a big focus of our marketing efforts these days so we took special care to make sure we provided youngsters with a great experience. 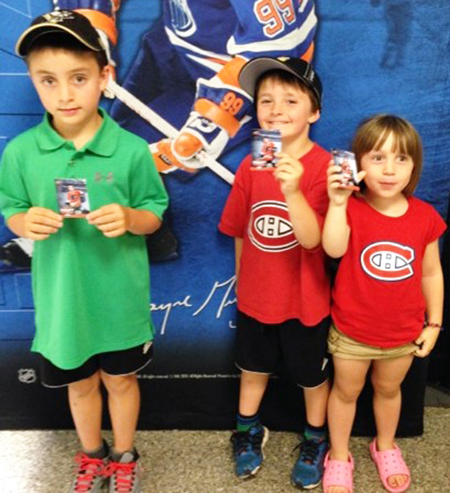 Whether it was sharing some insert cards with them while they collected with Dad or having them play in a bubble hockey tournament, they were all smiles all throughout the NHL Draft®. 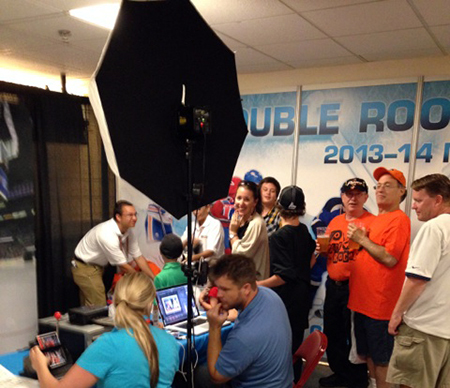 One of the big draws however, for kids and grown-ups alike was the opportunity to get professionally photographed in their favorite team’s jersey and get their very own Upper Deck card made for FREE! 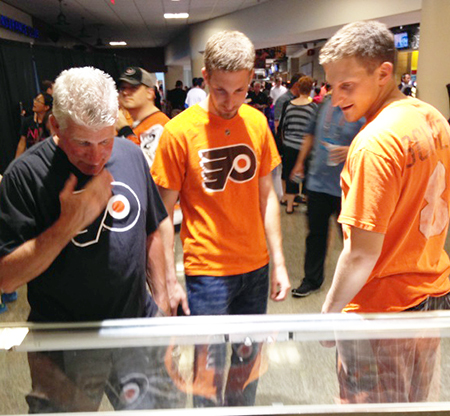 These keepsakes will be treasured by fans for years to come! 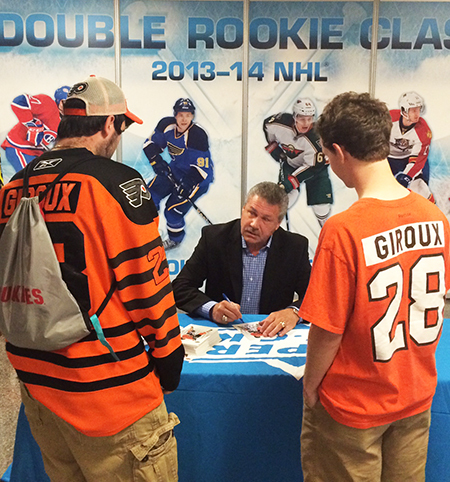 Upper Deck is all about bringing fans closer to the game which is why we brought in Dave “The Hammer” Schultz to spend some time with Flyers fans and sign FREE autographs for them on the second day of the NHL Draft®. 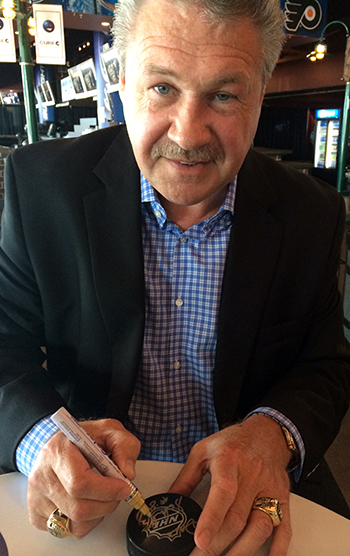 He was great and gave all the fans time, working through a very long line. 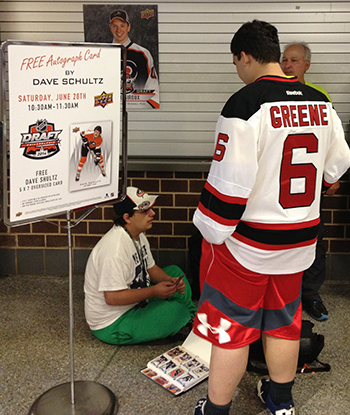 Fans got in line early to get a free autograph from Dave “The Hammer” Schultz. 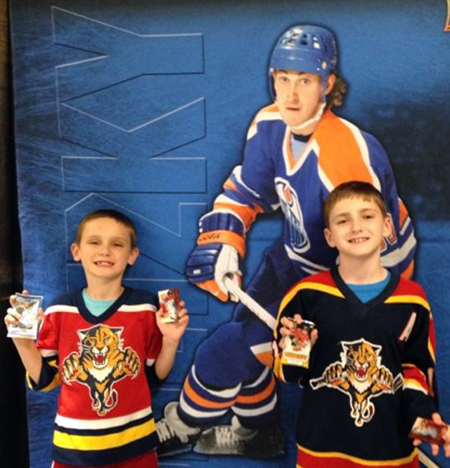 It was a great weekend for fans, and players alike. 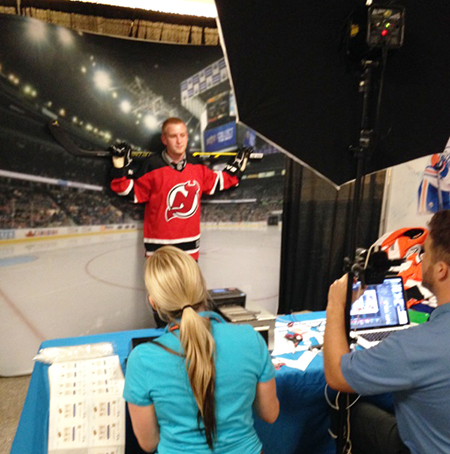 If you didn’t see what was happening behind the scenes, make sure to check out this story about “The Gauntlet” at the NHL Draft®! 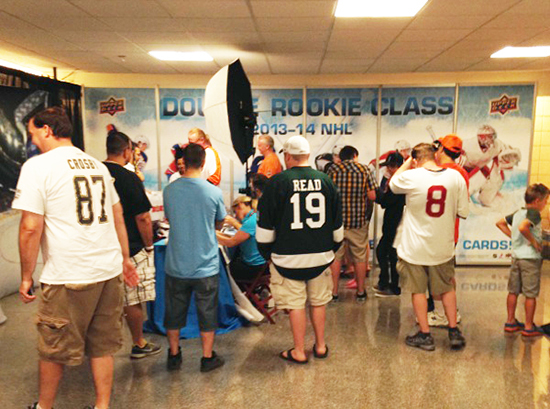 Special thanks to all our partners at the NHL, NHLPA and most importantly the fans who made this such a memorable event!